18-year-old right-handed pitcher Niklas Rimmel is finally signing a minor league contract with a MLB organization. More than a dozen clubs were interested in the services of the German U18 national teamer. The player of the Buchbinder Legionaere Regensburg is signing with the Minnesota Twins. 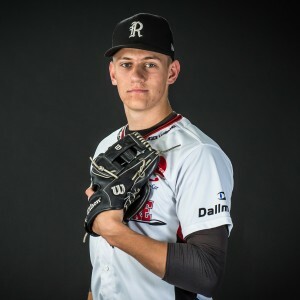 Rimmel, who began his baseball career with the Fuerth Pirates in 2009 joined the Buchbinder Legionaere and the Regensburg Baseball Academy in 2014. He is the fifth German player after Tim Henkenjohann (2001), Rodney Gessmann (2007), Max Kepler (2009) and Markus Solbach (2011) to sign with the Twins organization and the 12th players overall from the Regensburg Baseball Academy to sign with a MLB organization since 2007. Rimmel is going to finish school before joining the Twins organization in the summer of 2018. He pitched in ten games for the Buchbinder Legionaere in the German Baseball-Bundesliga this season. He is going to be the sixth German players currently under contract with a MLB organization besides Kepler, Pascal Amon, Sven Schüller (both Los Angeles Dodgers), Nadir Ljatifi (Cincinnati Reds) and recent signee Marco Cardoso (Boston Red Sox).